This is another mexican progressive rock band that was unknown to me, until I saw them some weeks ago in a short concert in a place called Parque Hundido, as part of the Audiorama sessions (Audiorama is a collective of Mexican musicians who open space to talented and independent bands that want to be heard), and when I saw them I knew I must have their album, so I bought it and I am happy with it, because Fusión Virtual offers music of high quality, with soft and exquisite touches in the vein of classic symphonic rock. The album represents what I witnessed that day, it contains 11 songs and a total time of 60 minutes of very nice instrumental music. It starts with “Fuga”, a very promising opener song. Here since the first seconds we listen to repetitive keyboards programming as background while a soft and delicate guitar plays its notes and after a minute drums enter along with some bass lines; please note that keyboards and bass are played by Eduardo García, so he is a very good composer that knows how to dose the work and put the instruments in the exact moment. Great song! “Aniversario” continues in the same vein, but even softer at least for the first minute, then drums enter and the rhythm is a bit rockier, but still soft without a doubt. I would say this is not the most complex prog rock I’ve ever heard, however, it doesn’t need to, I mean, its charm lies on its singularity, its softness and tranquility, so don’t expect bombastic moments. “Atardecer” has some rich atmospheres created by keyboards, while guitar plays its notes or endless riffs (not really riffs, but not chords either) and drums accompany with the rhythm. I like that fusion of symphonic rock with jazzy touches, a clear example of it is the song “Íconos” which besides the conventional instruments, it has an additional saxophone that puts a delicious tune, which suits perfectly in Fusión Virtual’s music. 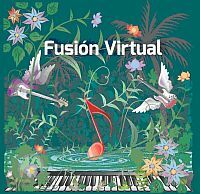 The next track is “Cause we’ve ended as lovers” original by Jeff Beck and greatly performed and arranged here by Fusión Virtual, it is a very nice rendition, totally lovely. The average length of the tracks is 5-6 minutes, so all of them are consistent compositions that can please our ears and relax our souls, like “Pasos” does with me. I like this song, its bass lines and its beautiful guitar notes that in moments are in the same channel of the bass, but it is better when each instrument plays different things. “Espiral” is another very nice track, classic rock with jazzy guitars, the sound is actually pretty catchy, but nonetheless enjoyable and relaxing at least in the first two minutes, later it changes and becomes more interesting when keyboards becomes more emotional and noisy, though the delicacy is never lost. This was the song I liked the most when I saw them live, and I can say is the one I like the most of the album as well. Though I like the album, I have to be honest, there are moments when the music follows the same path and I become a bit bored, I know it is Fusión Virtual’s style and own sound, but in moments I wanted a change that never came, so sometimes its repetition made me want to skip tracks, it happened to me with “Rumbera” the last time I heard it, the song is good, but I was a bit tired of the same sound. And “September” simply follows the same route, nice classic rock with jazzy touches, cool bass lines, keyboards as background, drums making the rhythm and guitar adding that cadency and deliciousness to the music. “Tema sin nombre” was another of the songs I listened in concert that caught my attention, it is cool as usual, charming, adorable. And last but not least “Tulum” comes in order to finish this very nice album that I fortunately own. I am lucky to know this band, and I hope more of my countrymen give a chance to them, they deserve it because the music they do is simply great, though it is not outstanding or the most amazing in my book, no, but what is good has to be spread. My final grade will be 7 out of 10.